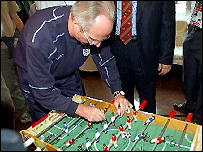 Sven signing what could be, your new table football - enter now! Sport Relief teamed up with Fletch and Ricco from the BBC's World Cup blog to give you the chance to win a truly amazing prize. We managed to get our hands on the table football mentioned in the book '23 Sweet FAs' by Andy Sloan. It's not just any old table football game this one has been signed by, among others, Pele and Sven-Goran Eriksson! Admit it, you all wanted it, you really wanted it - but congratulations go to Kevin Darton from St Helens. Fletch and Ricco also managed to get two of our tee-shirts signed by none other than Andriy Shevchenko! We will be sending these out as part of our 20 runners up prizes - so you never know you might have won as well. Thanks to everyone who entered and look out for more ways of supporting Sport Relief.